When we think of an enamelled steel object, we very probably tend to think of a substrate of metal covered in a material of a completely different nature. In fact, it is true: enamel and steel are profoundly different materials, the first being a vitreous mass with a shapeless structure made of binds of ionic type, the second being a crystalline material with binds of metallic type. Nevertheless, we can reach a high adherence, a very strong bind between substrate and covering. Enamel doesn’t detach! But what does this adherence depend on? An organic covering, paint for example, is applied to the substrate, dried and fixed at room temperature or a little warmer. A steel object is enamelled by firing at some 800°C. It is clear that, while firing, chemical-physical reactions occur which produce a very strong interaction between the two materials. Let’s try and understand what happens. In the firing phase of an object to enamel, the metal substrate oxides by the action of the oxygen released through the layer of raw enamel. As the firing temperature is reached, enamel turns to the liquid state “wetting” this way the oxide layer which has formed. The latter dissolve into the enamel and react with the so-called oxides of adherence (principally nickel and cobalt) contained therein. After the dissolution of the iron oxides, enamel adheres on the metal substrate. The surface becomes very wrinkled and forms dendrites, where the liquid enamel penetrates to mechanically bind on the metal while cooling. The metal sheet and the enamel can’t be easily distinguished from each other anymore. To improve the adherence, nickel coating was used on the steel surface. Today, to make the use of nickel unnecessary, a thick layer of special ground is used before enamelling, wet over wet, the final enamel. Since the adherence of the enamel on the metal surface is hard, it is thus more correct to consider enamelled steel like a system. We can easily think of it as a “bi-material” which sums up in itself the positive characteristics of the metal and the vitreous layer. Of course, in order for the synergy of the two materials to result really positive, the properties of enamel and metal must be adequate. The chemical composition ideal to both promotes the mechanisms of adhesion to the interface and grants a comparable thermal expansion between coating and substrate, such as to avoid internal tensions which could cause breaks and detachments. The surface of a table, as well as a cooking top or the facade of a building can be easily damaged. The daily use, an improper cleaning action with abrasive agents may cause incidental scratches, defects, opacification that make the surface lose its original appearance. Perhaps the object does not lose its functionality, but loses aesthetics and often this aspect is more important. Abrasion resistance becomes a very important property for a surface coating that will inevitably be damaged during its service life. Enamelled metal also responds well to this need. Due to its vitreous nature enamel has a high hardness and this property makes it particularly resistant to abrasion. It is necessary to distinguish between surface and sub-surface abrasion. In the first case the abrasive process is at an early stage. 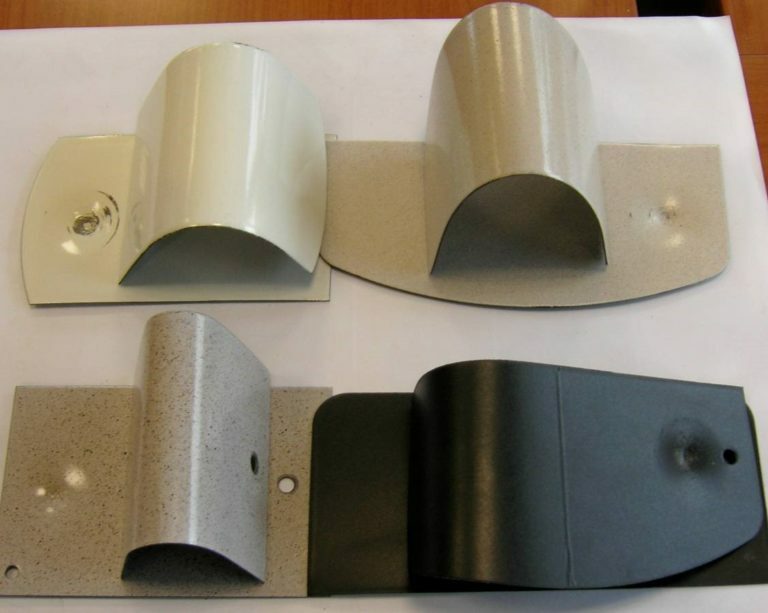 Considering high-gloss enamels, the abrasion cause damage that leads to increased surface roughness and a consequent reduced brightness, in addition also the capability to be cleaned, a special characteristic of the enamels, may decrease. For the low-gloss enamel surface abrasion can cause a change in the appearance of the surface, a change in the perceived colour or texture. The sub-surface abrasion refers instead to a more advanced stage where there is a loss in weight and hence thickness of the coating, until its complete removal. Acting on the formulation of enamels, and thus on their chemical composition, it is possible to improve resistance to the surface and sub-surface abrasion. It is possible to achieve significant increases in hardness with performance to satisfy even most demanding requirements. Just consider that the enamelled steel is used in industrial plants where abrasion conditions can be very critical. Thanks therefore to its remarkable resistance to abrasion, enamelled metals can be advantageously used both at home and in public places, where the probability of abrasions and damages is rather high. One direct result of the very strong adhesion established between the enamel and the underlying metal is the difficulty of detachment occurring. In case of accidental impact, the layer of enamel inevitably breaks down, creating cracks, defects or even the removal of flakes of coating, but contrary to what happens to paint, no further detachment of the enamel from the substrate occurs. In this way, only locally in correspondence of the defect, the coating will not protect the metal from the interaction with the external environment and the consequent corrosion phenomena. The very strong physical-chemical bond between enamel and metal avoids the increase of the exposed area and the possibility for corrosion to expand over time. Furthermore, the composition of some innovative enamels allows greater elasticity of the coating, reducing its fragility, allowing a certain degree of bending of the artefact, without coming to removal of coating flakes. The enamel layer protects the substrate steel against corrosion by isolating the metal from the aggressive environment. This protection system could be at first considered similar to an organic coating, and someone could even say with the disadvantage of being brittle. The comparison can’t be however done in presence of a defect. Both the coatings do not indeed protect the substrate locally where the defect is, thus allowing the formation of corrosion products. The local pH variation by defects, caused by the corrosion reactions, often leads in painting systems to cathodic delamination, that is the paint detachment from the substrate, as can be seen in the reported images. The enamel layer, thanks to its excellent adhesion to the substrate (see related chapter), shows instead no detaching problems, and the corrosion phenomenon is restricted to the uncovered substrate. This behaviour is extremely important; despite the possible defects and cracks formation enamel maintains its protective function on the rest of the object for a long time. The image refer to two samples, the one on the left enamelled and the other on the right painted, both artificially damaged, before and after the exposure in salt spray chamber. 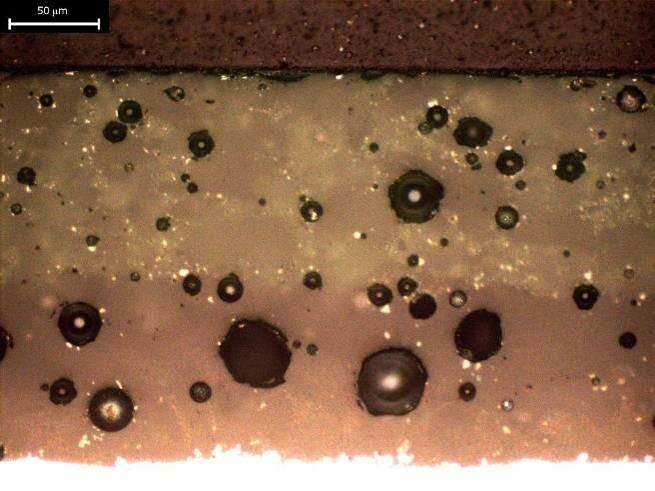 It is clearly visible that the defect on the enamelled sample remains localised and that the corrosion phenomenon has not increased in size. Thinking of a domestic environment a surface can come into contact with different chemicals: food in the kitchen, detergents, cosmetics, disinfectants, medicines. An appliance, a cooking top or a bath are required to show high chemical resistance because the contact with aggressive substances may lead to a degradation of the surface. Furthermore not only the functionality of the coating must be maintained, but also its appearance, its gloss properties, colour or surface texture. Thanks to its inorganic nature, the enamel is able to withstand contact with many aggressive substances. It is an inert material and therefore tends not to react chemically; as is known, it has a porous structure, but the pores are isolated within the coating that is so impermeable to liquids. Chemical resistance can vary considerably from enamel to enamel, but, in general, it resists well to all organic solvents, neutral salt solutions and most of the acidic or basic solutions. It is clear that even an enamel has limits but these are related to particularly aggressive substances as hydrofluoric acid or hot basic solutions. The enamelled metals are used in chemical and pharmaceutical plants, where the aggressiveness of the chemicals is particularly high. Therefore it is possible to obtain formulations with high chemical resistance.